Following on from our previous post regarding Fred Ford's involvement with a mysterious handheld, CRV in comments brought up this page. 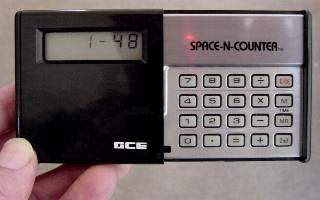 The game, Space-N-Encounter, has a horizontal screen and is a hybrid of handheld game and calculator. This was circa 1982. The screen and three games for it were designed by Tom Sloper. Phaser Fight - "Inspired" by Scramble, this game requires the player to navigate the spaceship through a treacherous landscape. It's a scrolling game (your ship is always in the general center area of the display). Meteorox - "Inspired" by Asteroids, this game requires the player to fly through an asteroid field. Shoot the rox! The player's motion is limited to the left side of the screen; rox that get past you on the left "wrap around" to the right and come at you again. Star Sweep - "Inspired" by a number of games, this one has an enemy minelayer causing you grief. The player's ship flies across the entire screen (bouncing off top and bottom) and "wraps around" to the left again. After reading Tom's long description of his one-off calculator, I'm not entirely sure it's related to Fred's work, but it's too interesting an anecdote to leave it submerged in the comments section. So, has anyone played on a Space-N-Encounter? 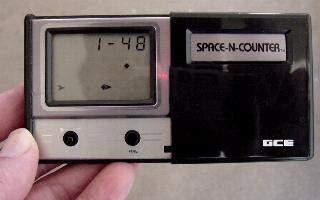 I loved this thing. I remember especially loving the joystick. you can't tell from the image above, but that's not 2 black buttons, it's one little eensy weensy analog stick and a black button. the control from that stick just felt like nothing else, and I think it's why I loved this thing so much. The response between calculator and game was very quick. I honestly think I played with this thing until it broke (you know, the trippy liquidy screen damage thing), and then was later discarded, I musta been about 11 years old. I'm so amazed I remember this thing, I wouldn't have been able to name it with a gun to my head, but seeing the picture just brought me back!